AudioCodes Mediant 1000B MSBG Chas., Copper 1000Base-T WAN, OSN3, 2GB RAM for MS OCS R2 Hybrid Gateway Config. Mediant 1000B MSBG Chassis, Copper 1000Base-T WAN Interface and OSN3 with 2GB RAM for Microsoft OCS R2 Hybrid Gateway configuration including VoIP Gateway, 3 GE switched LAN ports, Static Routing, RIP v1/v2, VLAN and basic Security package. Including OSN Server (V3) with 2GB RAM, 80G HDD with Microsoft Mediation Server R2. (Replaces old part number: M1KB-MSBG1-CH-OSN3-2G-MSH*). Product does not include RS-232 cable (part #M1K-RS232) which is used to access the CLI for serial communication. The Mediant 1000 MSBG is an all-in-one multi-service access solution for Service Providers offering managed services and distributed Enterprises. This multi-service business gateway is designed to provide converged Voice & Data services for business customers at wire speed, while maintaining SLA parameters for superior voice quality. The Mediant 1000 is based on VoIPerfect, AudioCodes' underlying, best-of-breed, media gateway core technology for all of its products. The Mediant 1000 provides superior voice-technology for connecting legacy telephone and PBX systems to IP networks, as well as seamless connection of the IP-PBX to the PSTN. In addition to operating as a pure media gateway, the Mediant 1000 can also host partner applications and serve as an IP-PBX platform. 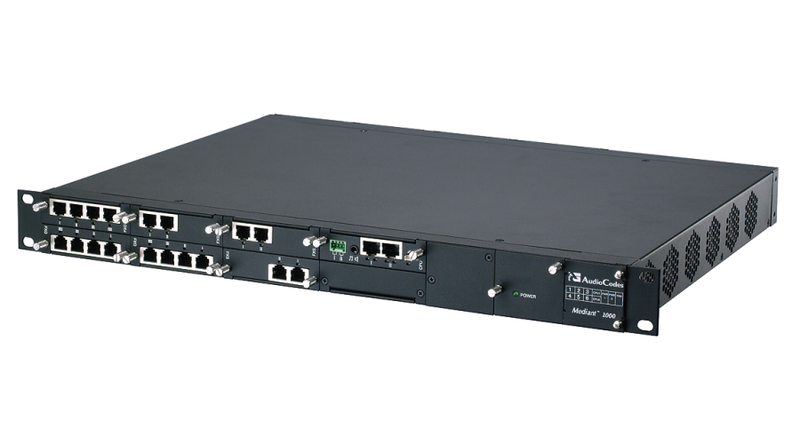 The Mediant 1000 is fully interoperable with multiple vendor gateways, Softswitches, gatekeepers, proxy servers, IP phones, Session Border Controllers and firewalls.